This new release harks back to the 1970s pure rock n roll sounds of Brian Cadd and The Bootleg Family Band, and marks 50 proud years of Brian celebrating his award-winning work in the international music business. Bulletproof is a powerful, rollicking, rock n roll album that will transport listeners back to the live show sounds of Brian Cadd with his famous Bootleg Family Band; from the opening track – and title song – Bulletproof, a reference to Brian Cadd’s 70 years young, through to the foot-stomping final song On The Edge. Whether you are a fan of Brian’s early work with the Groop and Axiom, his acclaimed hits Ginger Man, Let Go, and Little Ray of Sunshine, or his prolific work as a songwriter for the likes of Joe Cocker, The Pointer Sisters and John Farnham to name a few, there is something on this album for everyone. The album celebrates a collection of previously unreleased songs Brian had stored away, some that he had penned for and were previously recorded by other performers, and songs which were crafted right there in the studio… all sharing one common Bootleg Family Band theme – rock! While Brian says there was no intentional time frame for the release of Bulletproof, but now seemed fitting. Bulletproof was produced by Brian, together with gifted engineer Doug Brady, known for his work with John Farnham, Dragon and Jimmy Barnes, at his new Furstock Studios in Melbourne. Having been a teenager during The Bootleg Family Band era, Doug’s age difference provided a younger perspective to the project, and his subsequent success and experience combined to produce a sound which was true to the era, and yet unique and cutting edge. Bulletproof also features an abundance of guest performers like eclectic musician Wilbur Wilde, talented multi-instrumentalist Mike Rudd, legend Dai Pritchard from Rose Tattoo, Mick Skelton of Thirsty Merc fame, and Brian Cadd’s close friend Rick Fenn from 10cc on guitar and slide, just to name a handful of those who joined them in the studio. Stepping away from his famous ‘pop’ sound, the versatile full band created on this album is exactly the live music feel Brian wanted. 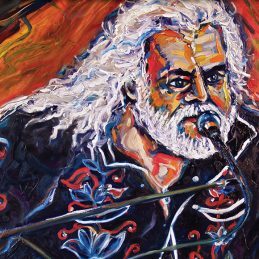 Taking songs he had written for other great musicians like Joe Cocker, The Pointer Sisters and Bonnie Tyler, Brian Cadd and The Bootleg Family Band also reinvents these songs with a new and different rock n roll sound. The visually stunning album cover, a painting by Archibald Prize finalist artist Philip Howe, captures the true fiery, passionate intensity with which Brian performs. Having met the talented artist Philip through musician Wilbur Wilde, the two bonded over a bottle or so of red wine. Philip then saw a Brian Cadd performance and was inspired to capture the strength and raw energy of him onstage. When the discussion of cover art came up for this album the painting was the obvious choice to depict the energy and spirit of this recording – it is everything that Bulletproof stands for. The Bootleg Family Band has always been Brian’s imagined proverbial ‘band in the head’. He was lucky enough to get that sound in the 70s, and now excitingly, gets to have a second crack at it with this new album. As Brian says, Bulletproof is the perfect opportunity and reason to “get the band back together”.